In an emergency situation you need to have your staff on the scene immediately. If someone gets hurt or seriously injured time moves on quickly. And if your company does not have the solutions to give emergency help and someone was to die? Your company, and in particular your CEO or Directors would be liable and could face a prison sentence here in the UK. Fortunately LRS brings a great paging system to solve those issues - the Butler XP. The Butler XP works typically from 2 x AA Batteries. But like all things on battery, sometimes, the operation could be jeopardized, so we developed the Butler XP Mains Converter. This is often used for health and safety and first aid. 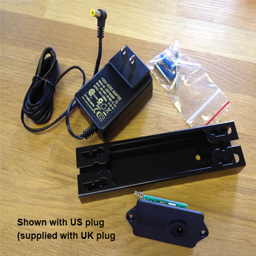 We guarantee the Butler XP when you use this power supply kit to drive the Butler XP from the mains. Easy to install and a great way to be able to 'install and forget'. Its so effective in health and safety and first aid applications. Used to allow customers to contact staff when they need assistance.